Daryl Hannah before and after plastic surgery, facelift or botox? 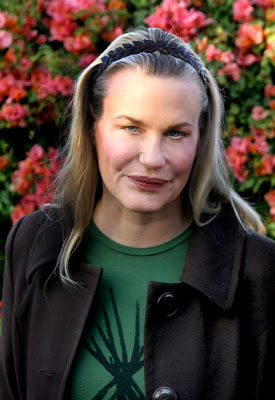 During the last couple of years, actress Daryl Hannah has been the subject of many plastic surgery rumors, after recent photos of her emerged while looking extra puffy and tight around the eyes, cheeks and forehead. Daryl Hannah recently sat down with the The Daily Mail and discussed her plastic surgery rumors. "There are so many people in LA who have had cosmetic surgery and they all look like Muppets, she says, firmly. There was a picture taken a while ago of me emerging from the ocean, with my hair slicked back and no make-up on. I looked as though I had puffy, squinty eyes and the rumor went round I’d had work done." "I've got a little jowly, and sometimes I look in the mirror and think, Oh my God, but I am too much of a coward to go under a surgeon's knife for something that wasn’t life-saving." 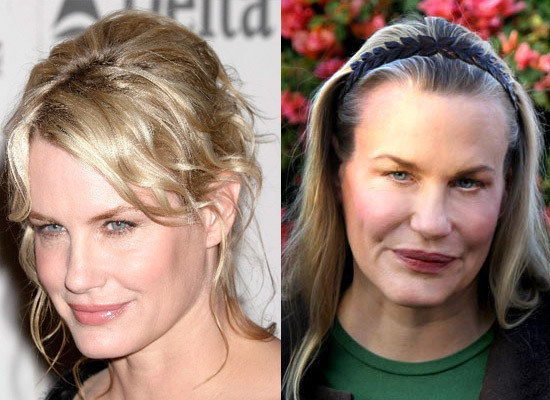 If Daryl Hannah is truly being honest and has never actually had plastic surgery, the only explanation for her change in appearance would be botox injections, which isn't technically considered plastic surgery. Do you believe Daryl Hannah or is this nothing more than another celebrity plastic surgery cover up? Doesn't even resemble Hannah......YIKES!! She's definitely had some work done, only the person doing the work must have been asleep on the job. She was a beauty before. I think if Hannah had work done, she'd look better than that. Geez, she looks 60! i just noticed that angelina jolie had a very different nose when she was younger. she has had jobs done! she is very pretty! but she has a very good surgeon! i know for sure that sharon stone has had plastic surgery. no one is old and then goes to looking younger without going under the knife. People get older and their faces change.....GEEZE....it's not that hard to understand. None of us look like we did when we were in our twenties at 40,50 and 60. Our faces drop, the skin sags, wrinkles and puffiness happen....Everyone acts like it's a rumor to age and get old. Guess what.....it's a reality that we get old and you know what...YOU WILL TOO GET OLD! Doesn't look like plastic surgery to me...just seems like she has aged. And btw, that pic is not very flattering. I need to see more. She's had filler in her cheeks and lips. She's gained weight too.